Whether you’re a professional hunter by trade, or simply a beginner looking to start out; taking down a target in darkness will always be one of the greatest challenges. A thermal scope can become your best friend when out in the field - your sight in the pitch dark. As hunting rises in popularity so does the market for these handy devices. While there are many high-end thermal scopes available to anyone with money to blow; affordable options are also not hard to come by. Hunting equipment is always personal. It’s all about what makes you feel the most comfortable when out in the field. And when under the cover of darkness, your comfort is paramount. That being said; safety is the one thing that outweighs comfort any day. A thermal scope is one of the devices that quite literally lets you see where you otherwise could not. When entering the property of wild creatures a reliable scope is critical. We took the time to review the top 3 best inexpensive thermal scopes to help you make your choice. What Is A Thermal Scope? A thermal scope is a device that a hunter mounts to their rifle to be able to hunt at night. It is an electronic mechanism with similar features to the conventional telescope, just with more impressive abilities. Thermal scopes use heat sensitive or infrared sensors to distinguish temperature differences in the dark. The thermal sensor (microbolometer) detects the temperature differences in objects and uses this information to generate a thermal image. The viewer is then able to see all that wasn’t previously visible in the dark. This technology was originally developed by the military to gain the upper hand in warfare. It has since been adopted by law enforcement, fire fighters and even everyday security guards - and of course hunters. Thermal scopes are not, however, only restricted to use in darkness. Hunters can make use of them in daylight as well. While everything will already be in view, the scope will still reflect temperature differences. This could help with spotting game that is camouflaged into the scenery. 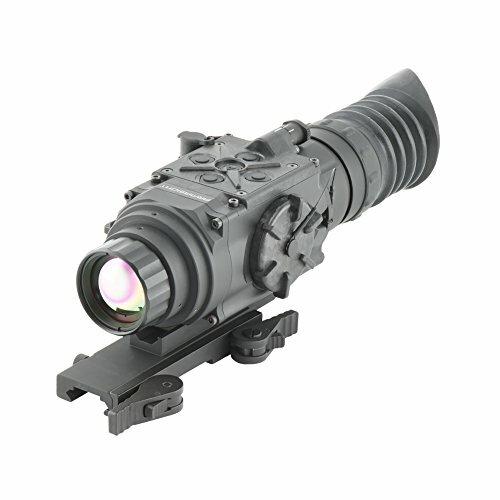 Thermal scopes are typically lightweight and not bulky. They add little to no resistance to your rifle and can be easy transported around the field. They are also usually incredibly durable, entirely capable of taking a tumble with you through even the roughest of terrains. Night hunting without one of these devices isn’t recommended. To follow are some benefits of investing in one to take along with you. Perhaps the biggest benefit of a thermal scope is the ability to see in complete darkness. Not only is the success of your hunt reliant on this, but your safety as well. Some thermal scopes feature on board video recording or live streaming via Wi-Fi. This lets you connect your experience with others in real time. Captured footage can also then be played back and reviewed later for assessment & discussion. Many hunters report improvement in their aim over time after working with a thermal scope. One of the greatest benefits will be how much more familiar with the hunting area you will become while navigating in the dark. After repetitive use, the pathways, embankments and foliage will no longer be as unfamiliar to you as before using a thermal scope. Thermal scopes vary greatly in price depending on a number of factors. They can start at around $1500 and range all the way up to $15,000 for the exceptionally higher end units. Sensor resolution is a big role player. Obviously higher resolution is a more visually desirable experience. The better the resolution the more expensive the scope. Cheaper scopes won’t offer as clear imagery - however they can still get the job done. 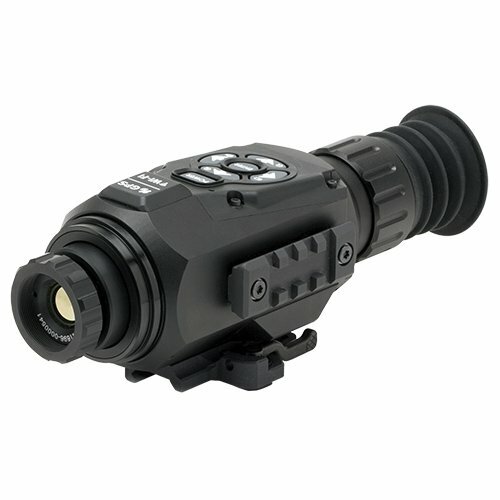 Some thermal scopes offer interchangeable lenses that can be purchased as add-ons. These are typically more expensive units. Most cheaper thermal scopes have fixed lenses that cannot be swapped. Thermal scopes in theory should all have waterproof bodies. Sometimes cheaper units are only water resistant, not fully proof. Perhaps the biggest decipherer of price are the seemingly unnecessary but very cool extra features. Wi-Fi connectivity, on board video recording, live streaming and still image capturing are some of these. With some scopes you can literally stream your hunt to social media as it unfolds. The more features the scope houses, the more expensive it is likely to be. This is one of the cheapest smart thermal scopes we looked at but in no way does it lack in impressive features. The ATN ThOR 4 operates at an impressive rate of 110,592 pixels. For a low cost thermal scope that is incredibly clear imagery. We are also very impressed with the built in batteries that are able to last 18 hours in the field before needing a recharge. The ThOR isn’t waterproof but is, however, weather resistant. Depending on the nature of the climate where you live this could be a deterring factor. Hunting in the rain wouldn’t be possible. The ThOR 4 has the ability to record both audio and video on board the unit. Unlike other units within this price range; it can hold up to 64GB SD cards inside. This isn’t a common feature in scopes of this price range. Dual streaming allows for all imagery to be viewed by a third party that isn’t necessarily in the field with you while you record as well. 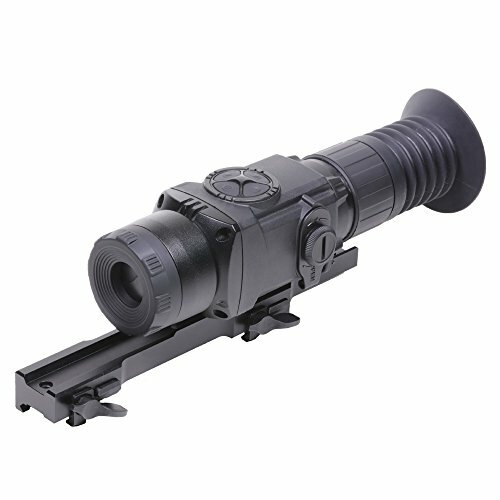 We love this little scope and its compact design. 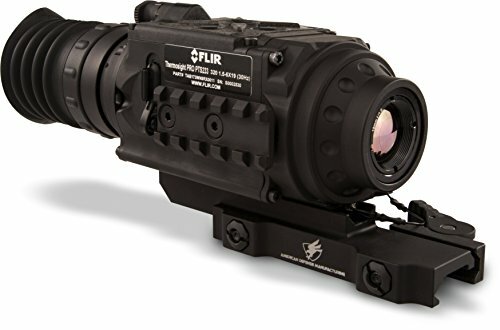 FLIR is one of the industry leaders in thermal visuals and this Thermosight Pro is its affordable offering to the scope world. While it doesn’t have the same storage capacity as the ThOR; the Thermosight can still hold 2.5 hours of on board video recording or 1000 still images. It cannot stream the footage elsewhere but can be played back at a later stage. Although it is compact in size it still manages to operate at an impressive human detection range of up to 800m. The feature of all features is its incorporation of the new Boson 12um core processor. This is state-of-the-art technology that was only recently released by FLIR. The fact that it is readily available in their less expensive models is worth the price tag alone. The Thermosight has significantly less pixel ability when compared to the ATN or the upcoming Pulsar Apex. However for a low cost unit it still showcases exceptionally high functioning. The ATN ThoR HD 384 comes from the well-known ATN Corp and is a great cheap thermal scope that comes with many smart features found on higher end scopes such as recoil activated recording, e-barometer, gyroscope, e-compass, WiFi streaming, ballistic calculator, and profile manager so you can easily swap between rifles without having to re-zero. The mount options are versatile with a Picatinny or interchange system available. The ATN ThoR HD 384 has a 384x288 thermal sensor with a 30Hz refresh rate and 1280x960 visual display. 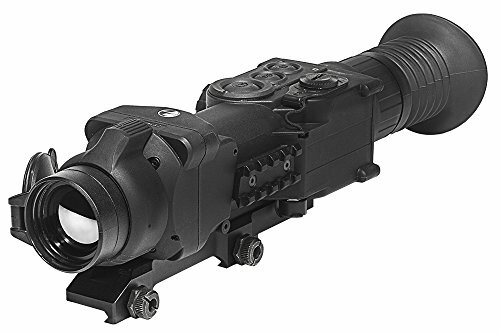 The 1.25-5x optic is good for shorter range targets with a human detection range of 625 meters, human recognition range of 280 meters, and human identification range of 170 meters. For longer range hunting, there are several models in the 384 ThoR HD line to choose from. The ATN 384 has an FOV of 16x12.5 and is also weather resistant so it can be used in almost any outdoor conditions. Battery life is also good at 8 hours of continuous use and an optional external battery pack can also be purchased for extended hunts. If you are looking to get your first thermal scope that has many of the latest features or simply want one for short range shooting and don’t want to spend a lot of money the ATN 384 HD is a great buy. The ATN ThOR LT 3x6x is the latest version of their entry level thermal scope. Do not be fooled by the fact that this is an entry level scope. The ThOR LT is loaded with features for an entry level thermal scope. The ThOR LT has a 17-micron 160x120 thermal sensor with a very impressive 60Hz refresh rate. The visual display resolution is 1280x720 and the range is good as well being able to detect humans at 475 meters, recognize humans at 240 meters and human identification up to 160 meters. 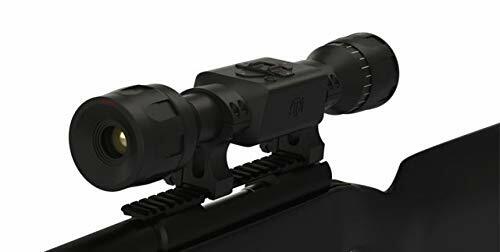 ATN also makes a 4-8x version of this thermal scope for longer range shooting with detection ranges of 625 meters, 315 meters, and 210 meters for human detection, recognition, and identification respectively. The ThOR LT has one shot zeroing capabilities, and extra-long 10-hour battery life and is weather resistant so you know you can take it along for almost any nighttime hunt. The ThOR LT is also the lightest thermal scope that ATN makes which is ideal for crossbow’s, air rifles, and traditional rifles. While the thermal resolution could be higher the light weight, feature set, and great price make this a perfect choice if your looking for the most inexpensive option from a well known company. The Pulsar Core RXQ30V is a great multipurpose thermal scope and monocular from one of the most well-known brands in the business today. The RXQ30V has a 384x288 17-micron thermal sensor with a 50Hz refresh rate and 640x480 AMOLED screen. This is one of the few thermal scopes that can also be used a thermal monocular if you do not want to mount it to your rifle. The RXQ30V is also IPX7 rated meaning it is waterproof so it can withstand any hunting trip you take it on. The Pulsar Core has 1.6x magnification as well as 2x, 3x, and 4x digital zoom and the field of view is 12x21. Detection range is also impressive at 985 yards. The Pulsar Core also has many features including one shot zero, picture in picture digital zoom, 10 reticles to chose from, and multiple identification viewing modes for different environments. Battery life is decent at 4 hours of continuous use and it is light weight at just over 1lbs. without batteries. If you are looking for thermal scope but also want to have a thermal monocular for times when you’re not hunting at night; but do not want to spend the money to buy two separate thermal imagers the Pulsar Core RXQ30V is great choice at a great price. With its full feature set, good detection range and trusted pedigree you are getting a lot for your money. The FLIR Predator 336 2-8x25 is Armasight’s (now owned by FLIR) entry level thermal scope designed for hunters. The Predator 336 has a 336x256 17-micron thermal sensor with a 30Hz refresh rate although they do make a 60Hz model if you will be hunting fast moving prey. The display resolution is 640x480 and the field of view is 13x10. The Predator 336 has 2x optical magnification and a 2x and 4x digital zoom allowing you to easily take out moving targets past 120 yards. There are also multiple color palettes to choose from for best use in different environments. Battery life is okay at 4 hours of continuous use although you can purchase an external battery pack for extended hunts. 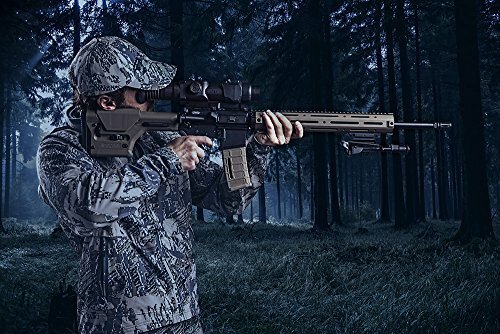 The Predator also comes with FLIR’s industry leading 2-year warranty, 3 if you register your scope and 10-year warranty on the thermal detector which is the highest in the industry. We do wish that the Predator came with more features like one shot zeroing, range finder and built in video recording; however if you are looking to purchase your first high quality thermal scope specifically designed for hunting the Predator 336 is a great buy. When it comes to low cost thermal optics the Pulsar Apex takes the lead in most powerful unit thanks to its impressive 2.2x native magnification ability. It has pixel display to match the ATN ThOR 4 also at 110,592 pixels but unlike the ThOR is entirely waterproof and weather resistant. This unit is slightly more expensive than the others. Because of this we would have at least expected a better battery life however the Apex only manages four to five hours at full charge. This aside, its ability to detect an animal up to 1300m away is quite astounding on such a compact device. While the Apex can’t hold any video or audio footage on the unit itself, it can be linked to an output device for recording externally. As hunting grows in appeal, so will the world of thermal imagery. We can only hope that as it does these impressive brands such as FLIR, Pulsar & ATN continue to deliver affordable yet quality options for the low budget hunter. Our personal winner in this comparison was the ATN ThOR 4 1.25-5x thermal scope. The jam-packed list of features speaks for itself. The fact that it offers all these specs but at the lowest price is a wonder. Your thermal scope should be an extension of yourself and your needs in the hunting field. And so we ask; which one do you have your eye on?